Just taking the photo won't do these days - you'll want to edit and share it, then rake in the likes. Except most cameras pretty much bail out at the snapshot. Not the Samsung Galaxy S4 zoom though, a hybrid of a point-and-shoot with 10x optical zoom and a Galaxy S4 mini. 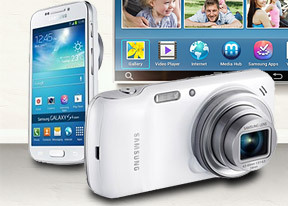 This is Samsung's second such attempt after the Galaxy Camera, which was based on the Galaxy S III. The Samsung Galaxy S4 zoom has full telephony features (unlike the Camera), but it's not the most comfortable phone around. Photography is the full-time job here. A 10x zoom lens with Optical Image Stabilization (OIS) sits in front of a 16MP sensor. At the wide end, the lens is the very wide 24mm in 35mm equivalent, the aperture goes from f/3.1 to f/6.3 and there's a mechanical shutter. The Galaxy S4 zoom has a control ring around the lens like some high-end point-and-shoots do, a xenon flash and LED light. That's just the camera specs, the rest is a full-featured Galaxy S4 mini hardware, including the IR blaster, which can control a projector (the one, most likely, you'd use to show off your photos). There are some differences between the Galaxy S4 zoom and the mini but, outside the size, those are insignificant. The chipset is powerful enough to shoot 1080p video at 30fps and 720p at 60fps (same as the Galaxy Camera). Samsung has made sure too that the default camera app is the most advanced we've seen yet, and there are a number of helpful image and video editors among other tools. With Android 4.2 you'd be able to install other editors and camera apps too (though these will have to add support for the optical zoom feature). Not to mention all the social networking and other tools for sharing your photos, which can be piped through blazing fast LTE or Wi-Fi, DLNA, MHL or Group Play. Jump over to the next page for a closer look at the hardware, while we try to avoid any "zooming in" puns.